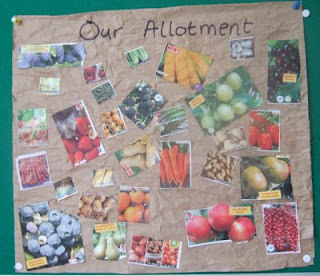 We have been so greatly blessed by our allotments, since moving here in 2004. As soon as we had a moving date to come here my resourceful husband had searched out the nearest allotment society and asked to be put on the waiting list. By a miracle there was no waiting list at that time and we were able to sign up straight away. Allotment growing is undergoing a huge renaissance at the moment - it is a very fashionable pursuit indeed. For us, growing our own is a practical necessity and the food we grow on the allotment contributes a huge part to our household ecconomy. With careful storage and preservation of the harvest we hope to eventually become almost self-sufficient in fruit and vegetables (and there is the added blessing of being able to share our surplus with friends and neighbours). We try to be as organic as possible and certainly without it we would not be able to afford shop bought organic vegetables. Before we had the allotment I calculated our weekly fruit and veg bill and worked out how much it would be if we switched to organic. Three times as much! I would greatly recommend growing your own to anyone with even a tiny square of outside space. Even a window box could be put to frugal use to grow something like salad leaves, for example (for less than the price of a bag of designer salad leaves you can get a packet of seeds that will supply you for much of the summer). You can even recycle old containers to save money. We grow lettuce and celery in 6 pint milk containers and onions and carrots in catering size yoghurt pots salvaged from our local Indian restaurant.